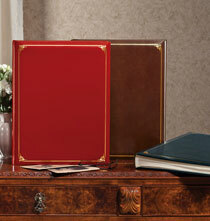 Organize and keep safe your collection of treasured memories with this leather Personalized Oversized Scrapbook. PersonalizedThings by Exposures large scrapbook albums are ideal for preserving and arranging photos, historical documents, newspaper clippings, cards and letters, certificates and so much more. Crafted in the style of a leather scrapbook made in Italy, our version features quality acid-free paper pages made in Italy. 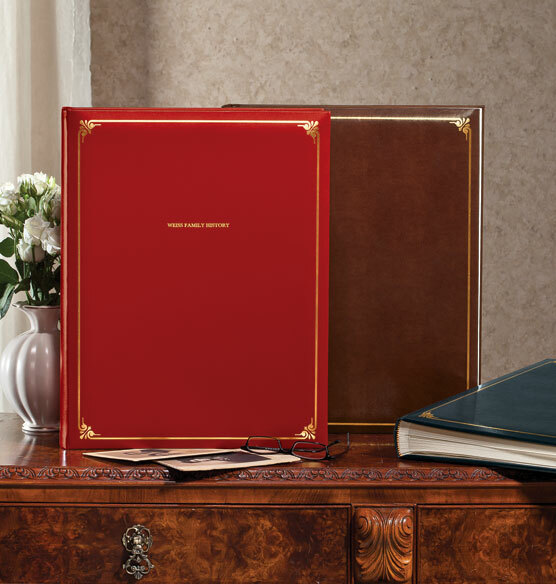 Personalize these monogrammed photobooks with up to three lines of gold text for a rich, distinguished leather-bound album. Do the pages have sleeves or do you paste items on the paper? BEST ANSWER: There are no sleeves in the album. It is made with wonderfully weighted creme paper with tissue pages between each page. There are various ways to attach photos and mount memorabilia to the pages. No sleeves - but each page has a protective sheet. It is a beautiful album. No sleeves, you have to affix each item on the paper with adhesive. Are there thin "separator" pages between each page? BEST ANSWER: Yes, there are very high quality thin sheets between each page. This is a very well made scrapbook, however, I was surprised at the size, much larger than I expected. I believe so. I bought each of my grandkids one and we filled them with pictures for their graduation party. there is thin pages between each scrap book page. Nice large albums!! Yes, there are thin, tissue like separators between each page. Does this book lay flat when opened? Can you add more pages ? BEST ANSWER: No, unfortunately you can not add or reduce pages. Pages are glued together. Thank you for your question. The Leather Oversized Scrapbook can not have pages be added to it as the package are bound in the book. We hope this information will be of help to you. No! However each page has been greatly enlarged from the traditional-sized scrapbook and there are plenty of pages. It will take me a long time to fill up my book! No, I'm afraid not. The pages are bound and not loose leaf. They are interspersed with white tissue. I prefer the bound scrapbooks to the loose leaf photo albums. How many pages does this scrapbook have? BEST ANSWER: Thank you for your question. The Personalized Leather Oversized Scrapbook comes with 50 pages. We hope this information will be of help to you. BEST ANSWER: Thank you for your question. This item measures 14 3/4" wide x 18 1/2" high x 3" deep.We hope this information will be of help to you. Cover measures 14-1/4 inches in width and 18-1/4 inches in height. BEST ANSWER: Thank you for your question. We no longer carry the 12 x12 size. We hope this information will be of help to you. BEST ANSWER: Thank you for your question. Unfortunately we no longer carry the 12x12 size. We hope this information will be of help to you. I have a beautiful album that I purchased from Exposures years ago (perhaps 11 years ago). It is 10' x 14". 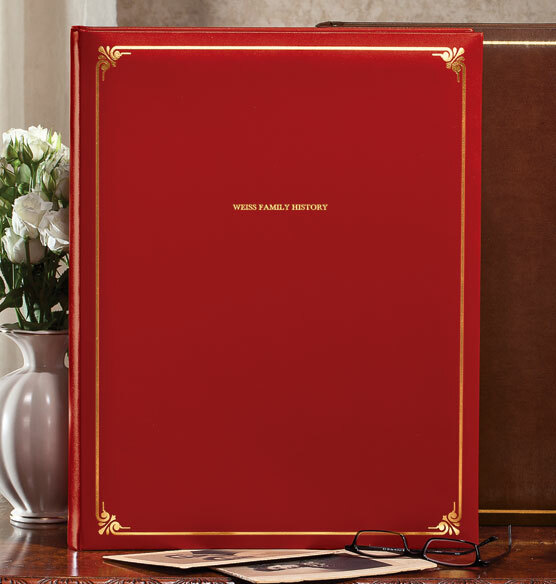 It is made of red, bonded leather and engraved in gold print are the words "Holiday Celebrations" it is a scrapbook with fixed pages, each with a thin film of tissue separating it from the next. Do you still make such a book? I would very much like to order another pair. Thank you. BEST ANSWER: Thank you for your question. Unfortuantely we no longer carry the scrapbook you are looking for. This is the only bound scrapbook that we have at this time. We apologize for any inconvenience and hope this information will be of help to you. Could I see three available colors please? BEST ANSWER: Thank you for your question. The first photo shows red, cognac and navy blue. We hope this information will be of help to you. Album or scrapbook for old photos? is this available with less pages? BEST ANSWER: Thank you for your question. Unfortunately no, we do not offer this album with fewer pages.We hope this information will be of help to you. are these available with less pages? BEST ANSWER: Thank you for your question. Unfortunately no, we do not carry this album with fewer pages.We hope this information will be of help to you. Does it come with an acid free storage box? BEST ANSWER: Thank you for your question. The scrapbook does not come with a storage box. We hope this information will be of help to you. I am looking for plastic NO pockets photo sheets. Is this whats inside this album? BEST ANSWER: Thank you for your question. This scrapbook only comes with scrapbook pages. No pockets, photos or any item needs to be taped or glued. We hope this information will be of help to you. Can we use Russian Cyrillic for cover personalization? BEST ANSWER: Thank you for your question. Unfortunately no, the font for this album can not be customized. The font will be as shown in the picture. We hope this information will be of help to you.